A Cornish-born hero of the 9/11 terrorist attacks has been honoured with a memorial in the United States. 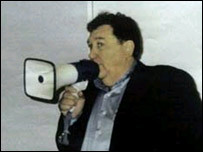 Rick Rescorla, originally from Hayle, was the security manager for Morgan Stanley Dean Witter at the World Trade Centre in New York. 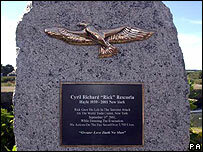 The Cornishman died after he led 2,700 people to safety when the planes struck the twin towers on 11 September 2001. More than 500 people attended the unveiling ceremony at Fort Benning, Georgia, where he trained in the army. The 62-year-old, who shepherded thousands down from the south tower, was last seen going back up the stairs, but his body was never recovered. In 2002 calls for a UK gallantry award were rejected because Mr Rescorla had become a naturalised US citizen in the 1960s. But Prime Minister Tony Blair has backed calls for a posthumous American Presidential Medal of Freedom. Mr Rescorla was a US Army Colonel and was decorated for his service in Vietnam. Susan Rescorla said the statue would be permanently sited at Fort Benning in Georgia where her husband had done his army training. "He left from Fort Benning for Vietnam and returned with many medals," she told BBC News. "It seems fitting for his legacy to be in front of the national museum. Inside are his medals and pictures of what happened on 9/11 and pictures of Rick as a colonel." Mrs Rescorla said wonderful tributes had been paid to her husband, including memories recounted of the Cornishman singing "Goin' up Camborne Hill, comin' down". "This is really the pinnacle and a legacy for Rick who is a new hero for the new millennium." Mervyn Sullivan from Hayle, who was a boyhood friend of Mr Rescorla, flew over to the US to attend the memorial unveiling. "When Rick came back to Cornwall, we never failed to get together and go for a drink in the Cornish Arms. "We brought over a 5ft (1.5m) black and white St Piran's flag and gave the Cornish salute in the Cornish language. "Rick loved Cornwall and never forgot his Cornish roots."